How is it almost Easter already? I mean, seriously. Time needs to slow the train down. Despite the fact that this holiday often sneaks up on me, Easter has always been one of my favorite holidays when it comes to food. We are creatures of habit on my fathers side of the family and our spread always includes my grandma's deviled eggs, my aunt Joanne's sticky caramel rolls, my uncle Steve's Bloody Marys and, of course, lots of locally made sausage and a glazed ham. Truth time: When I growing up in Minnesota, I think I stuffed my face the most at Easter. To an embarrassing degree. Ok, glad I got that off my chest. I feel like we are closer now, you and I. Yes? One of the reasons I love cooking is because I get to take pieces of my life and bring them together when they might otherwise remain separate entities. Here, I've taken deviled eggs, which will forever and always make me think of my grandmother, and added ingredients that reflect our time spent in Japan. White miso paste, hot mustard, and shichimi togarashi come together in these eggs to create something new for your Easter brunch. A couple of these alongside my Japanese Bloody Mary would be absolute perfection. Another change I made to these eggs was using Greek yogurt in place of mayonnaise. I think Greek yogurt gives the yolk mixtures a lighter, fluffier consistency that is a welcome contrast to the bold flavor of miso and hot mustard. 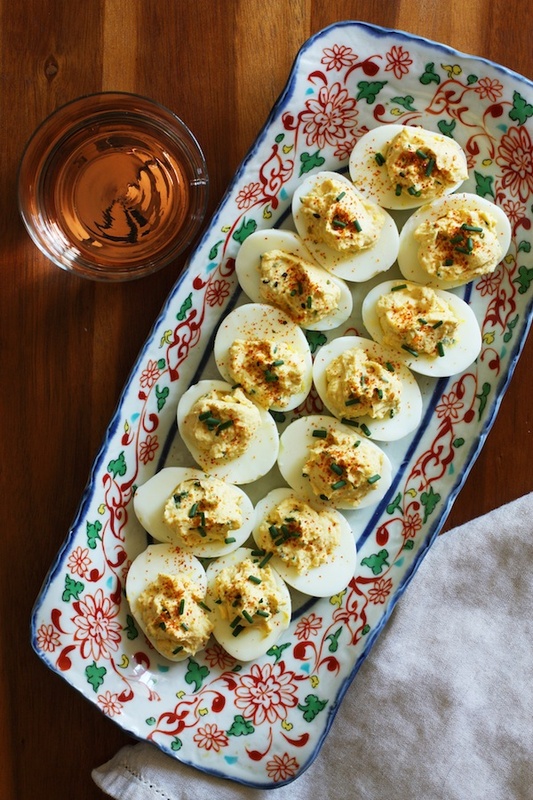 I used Tillamook Farmstyle Greek Yogurt, which is mellow and creamy and absolutely perfect in these deviled eggs. The icing on the cake? Fresh chives cut directly from my garden. Glorious. · Tillamook Farmstyle Greek Yogurt is made with no artificial flavors, no artificial colors, no artificial sweeteners, no high fructose corn syrup and with the highest quality milk from cows not treated with artificial growth hormones. · Tillamook Farmstyle Greek is a thick, creamy and less tart yogurt made with buttermilk cultures, while providing 14g of protein per serving. · To make their better tasting Greek distinctively ‘Farmstyle’, Tillamook slow churns farm fresh milk with seven active yogurt and buttermilk cultures. · To find out where to buy Tillamook Farmstyle Greek Yogurt readers can use the handy ‘Where to Buy’ tool by clicking here. *Full disclosure: Tillamook provided me with product to use in this and other posts. My opinions are 100% my own and this post contains no affiliate links. Prepare an ice bath in a large bowl before you begin hard boiling the eggs. Gently set the eggs in the bottom of a large pot and fill with cold water until the eggs are covered by about one inch. Place the pot over medium heat and bring to a low boil. Turn off the heat, cover the pot, and let sit for 6 minutes. Remove the eggs from the pot with a slotted spoon and transfer to your prepared ice bath. When the eggs have cooled (after about 10 minutes) peel the eggs by first tapping them against the countertop. I like to crack around the equator of the egg and at each end. Using the side of your thumb, carefully peel away the egg and the thin membrane between the egg shell and the egg itself. After hard boiling the eggs and removing the shells, cut them in half and remove the yolk using a small spoon. Collect the yolks in a medium bowl and set the emptied whites on a large plate. In the bowl of a food processor, combine the yolks, mustard, yogurt, and miso paste and pulse until smooth. Stir in the chives. Using a teaspoon, fill each egg half with the yolk mixture. Garnish with a few additional chives and the shichimi togarashi. Arrange the eggs on a platter and serve chilled.